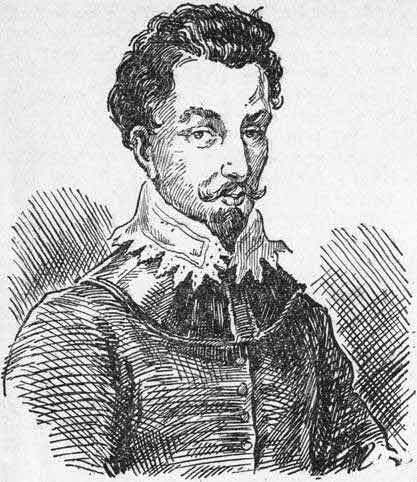 Francis Drake, one of the most famous of English sailors and pirates, was born in Plymouth, a seaport and the largest town in the south of England. The boy spent much of his time looking at the ships in Plymouth Harbour and talking to the seamen. His cousin, Captain Hawkins, told him long stories about his adventures at sea. At fifteen Francis was taken on a small ship and worked there for some years. The boy learned the duties of a sailor very soon and did his work so well that the master of the ship said the boy was born to be a great sailor. When Drake was twenty-five Captain Hawkins made him mate on his ship. Drake's first sea-fight took place on the other side of the Atlantic Ocean where a small fleet of six English ships was attacked by Spanish men-of-war. Four of the I English ships were burnt and only two — the one commanded by Hawkins and the other by Drake — came back to England. Drake asked the king of Spain to pay him for his ships but was refused. Drake was very angry and promised he would take all he could from the king of Spain. And he did so. He crossed the Atlantic again with two small ships and took some Spanish ships loaded with gold and silver. Now Drake had money and could choose his sailors. He took on his ships the bravest and most skilful sailors in the land. When he crossed, the Atlantic again he burnt a Spanish town and took a number of Spanish ships. At the head of a party of Englishmen and Indians, Drake marched across the Isthmus of Panama, which joins North and South America. The Indians told Drake that from the highest point of this land two great seas could be seen — the Atlantic, which he already crossed, and the Pacific, of which he only heard. When Drake saw the Pacific Ocean he knew that he must explore the unknown sea and sail an English ship in the waters where only the ships of Spain and Portugal were seen. In November 1577 five ships with Francis Drake at the head sailed from Plymouth. Drake wanted to cross the Atlantic and pass through the Strait of Magellan. The voyage was dangerous. Magellan himself was killed on his way through the strait. Drake came to South America only in April and in August entered the strait. It was narrow and the wind was very strong. Every morning there was frost and snowfall. Strong storms fell suddenly on them and threw the ships to left and right. In September the brave explorers saw the Pacific Ocean. The ships sailed along the western coast of South America, but strong storms threw them south and Drake lost some of his ships. At last they reached some islands and landed there. After Drake explored the land he told his sailors that they were on the southernmost point oi land in the world, Cape Horn, the most southerly point of South America. 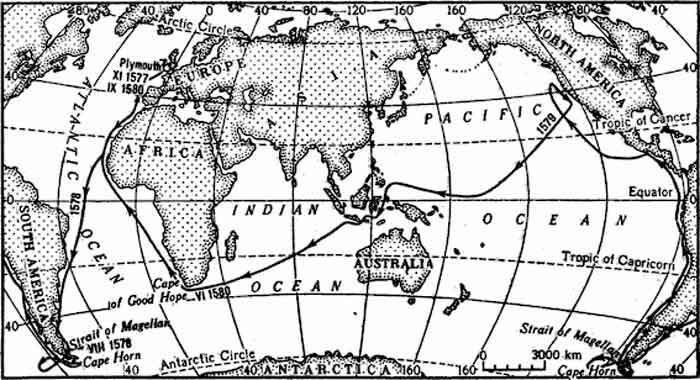 After a short rest the ship sailed north where Drake expected to find a strait between America and Asia. But to his surprise Drake came to the North American continent again. They found a harbour and spent some time there repairing the ship. When all was ready Drake left North America and wanted to cross the Pacific. After they visited the island of Java, in the south of Asia, Drake sailed across the Indian Ocean to the Cape of Good Hope, where he came in June 1580. Drake did not stop on the South African coast, but sailed north and after visiting the Canary Islands, he made his way across the Bay of Biscay and in September 1580 the sailors saw the great chalk cliffs of England. The voyage lasted nearly three years. Drake was the first Englishman who sailed round the world. About five years after Drake had made his great voyage round the world, he again crossed the Atlantic Ocean, and attacked Spanish ships. From this voyage he brought home a large number of cannons and much wealth. Soon the news came that the king of Spain was preparing a great fleet, the Spanish Armada, with which he wanted to invade England. In 1588 the Spanish Armada came up to the coast of England but the English sailors did not attack the enemy. They let the great Spanish ships pass Plymouth and go far into the English waters. The English ships were much smaller but well handled. Eight fire-ships with Francis Drake at the head went into the middle of the enemy fleet and attacked the Spanish ships. One Spanish ship after another caught fire, Drake boarded and carried off twelve ships. This was a great victory of the English over the Spanish Armada. Of the one hundred and thirty-two Spanish ships only about fifty returned, and they were in bad condition. About seven years after this great victory— in 1595 — Drake, at the head of a large fleet, sailed from Plymouth again to attack the Spaniards in America and the West Indies. The Atlantic was crossed in a month, but soon afterwards Drake fell ill. In January 1596 he died and was buried at sea. Englishmen have set up a monument to Francis Drake in Plymouth.